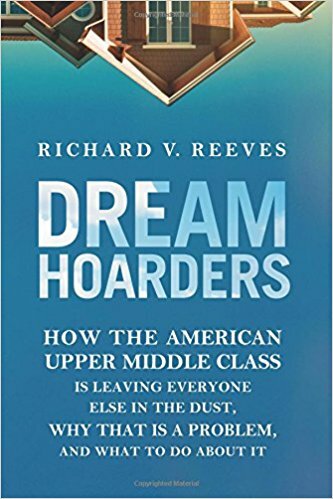 In a recent Times Op Ed, ("How We are Ruining America,"7/11/17), David Brooks cites a book entitled Dream Hoarders, by Richard Reeves of the Brookings Institution. 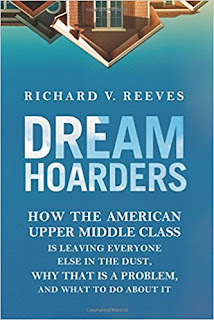 Brooks’ point is that the privileged classes of America not only want to insure that their children maintain educational hegemony, but that they make sure that those of more modest means are prevented from gaining entrée. The fact that affluence breeds an intrinsic parsimoniousness and miserliness and that rather than being sated those who have been able to achieve their goals perpetually want more is practically an axiom of human behavior. Countermanding this tendency is the so-called altruistic impulse that some epigenetics people feel is naturally selective, but to put forth another term employed by Daniel Kahneman in books like books like Thinking, Fast and Slow, many people suffer from irrational, emotion-based behaviors. Part of the lack of generosity evidenced by a materialistic culture, in which hedonism has attained almost ethical status, derives from the feeling that there isn’t enough to go around and that one person’s pleasure is another’s pain. With these kinds of priorities, it’s no wonder that society is polarized in a way that mirrors the accumulation of wealth itself--in which money invested and reinvested creates ever great amounts of capital accumulation and inequity. In The Structure of Scientific Revolutions, Thomas Kuhn famously coined the term "paradigm shift." The reformation of our educational system requires a sea change in thinking. It’s one thing to be single-minded and another to narrowcast to such an extent that you don’t see the woods from the trees. It’s like a fighter who throws punches but doesn’t know anything about defense. Eventually he or she will be knocked out.